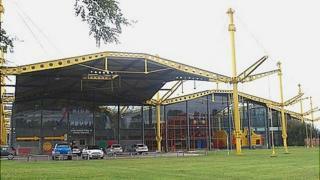 A yellow-roofed warehouse in Swindon that featured in a James Bond film has been given Grade II*-listed status. 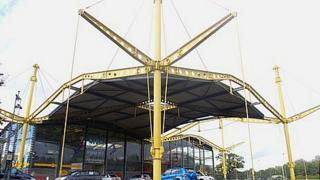 The Spectrum building, Renault's former distribution centre, was designed by Lord Foster and opened in 1982. Featuring yellow steel "umbrella masts", the futuristic single-storey glass-walled building was also used as a backdrop in A View To A Kill in 1984. Roger Bowdler, from English Heritage, said it was "one of the very finest examples of a hi-tech building". Famous for his steel and glass designs, Lord Foster created the Gherkin and Millennium Bridge in London, rebuilt Berlin's Reichstag and also Hong Kong Airport. The headquarters he designed for Renault cars in Swindon has now been given Grade II*-listed status by English Heritage in a move to "protect post-war architecture". "On the face of it, a distribution centre in Swindon is not the most obvious candidate," said Mr Bowdler. "But it has high national interest." 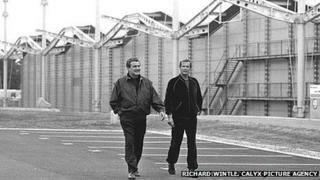 The building saw the last of the car manufacturer's workers move out when Renault closed its operations there in 2001. Since then, the 25,000 sq m building has housed a car seat manufacturer, a soft indoor play centre and a firm that produces DVDs. It was also chosen by the Bond films production team to shoot several scenes with Roger Moore in his final outing in the role. English Heritage has also listed a civil defence bunker in Gravesend, Kent, an electricity substation in Moore Street, Sheffield, and Capel Manor House near Tunbridge Wells, Kent. Almost 700 post-war buildings have been listed in the past 25 years.